Plano's All Weather gun cases protect your firearms from damage and the elements. 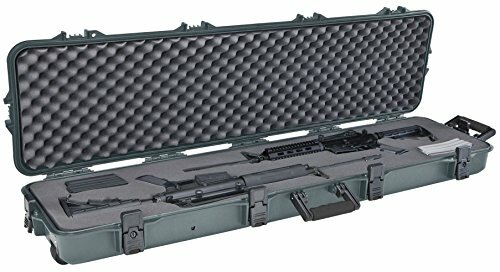 With rugged, industrial-strength construction and a continuous Dri-Loc Seal, All Weather cases create a watertight and airtight shield that protect your guns even in the most extreme conditions. And with heavy-duty, dual-stage lockable latches and a built-in pressure release valve, the cases are designed to withstand the continuous bumping and jarring of airline travel. Exterior 54.625" x 15.5" x 6"
Interior 51.5" x 12.63" x 5.25"